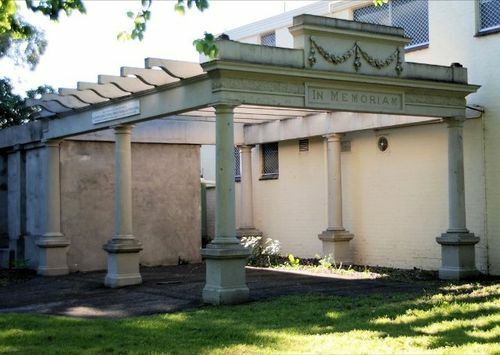 Greek-style wooden structure in the form of a pergola was erected by cricket, football, bowling, baseball and tennis clubs to commemorate members who died in service or were killed in action in World War One. The names were originally engraved on bronze tablets around the pillars. The unveiling was performed by Brigadier-General Lloyd who replaced Brigadier-General Elliott who was unable to attend due to illness. Brigadier-General Elliott's brother was listed on the memorial as one of the fallen. Fitzroy City Press, 13 December 1919. "This memorial has been created by the Fitzroy cricket, football, bowling, baseball and tennis clubs to perpetuate the memory of members who fell in the Great War 1914-1919."